Rydertech: Computer 101: What is a Sound Card? A sound card basically is a system in which it sole function is to process sound and output them through the speaker. 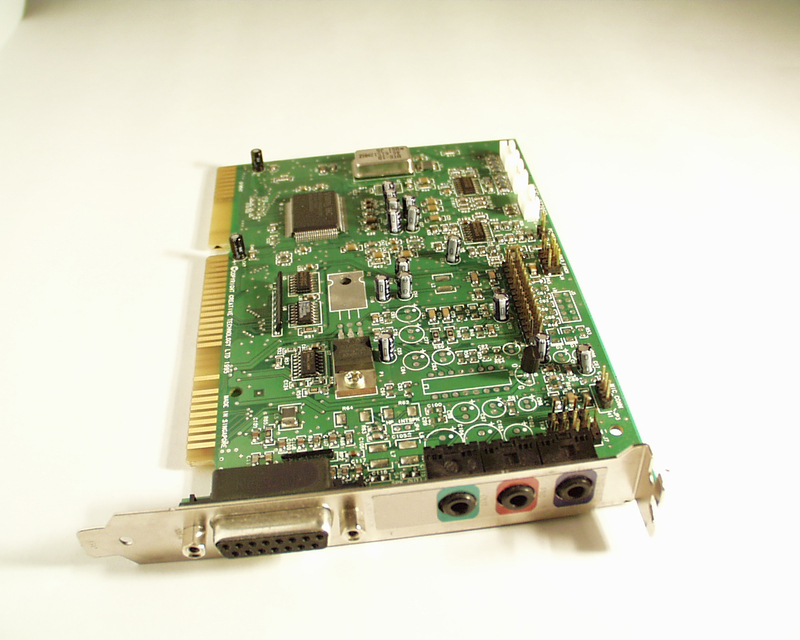 There are two types of sound card, the built in type and the expansion type card. But There is no difference in there function, the only difference is the characteristics of each type. Then what is a built-in sound. This type of sound processor is usually found embedded in the motherboard of main board of the computer. If you buy a motherboard and it indicate on the label by this sign SVL, the S stand for Sound while the V for video and the L stand for LAN or network card. Most standard motherboard has a built sound card for standard listening of music and sound from a streaming video, internet chat and any other type of application. However every one has the option of getting a separate sound card with better sound processing hardware and software. A high end sound card usually cost more and is better able to handle and process better sound output. Another things is they have more output port in them for connections to a wider range if speakers. Also speaking of speaker all sound card needs to have matching speaker for one to have a more enjoyable music listening appreciation. Beside speaker port a sound card also process input sound or a microphone can be connected to it, this port is called a line-in port or microphone port while a speaker port is usually called a line-out port. But to truly enjoy the experience of listening to music or it enhances the playing of games. A quality sound card and speaker should be use to have an enjoyable experience. Another function of the sound card is the recording of sound, whether it is a voice or music being saves in to the computer for editing and manipulation. Together with a quality microphone and editing software, one creates his/her own distinct sound or records his own voice while singing with her favorite band or singer. A computer will work without a sound card or sound processing system but it has become an essential part of today’s latest multimedia components to enhance the overall appeal of a computer. Also the function of a computer has be upgraded with the addition of a sound card. The computer can now become your home video theater and home surround system. We did not need to purchase a separate sound system or video system. A high end computer with quality sound card and speakers can replace both video and sound system in our home, office, schools and many other places.